Hey guys, so I got asked by a reader how I did the hearts on my heart nails! So today while bored at work I made a little graphic tutorial in paint! It's not the best, but you'll get the point! The first way is the way I tend to do mine. I'll explain them in words! Step 1 - Make a line with your detail nail art brush, starting in the upper left corner of the heart, and pull downward, ending where you would like the point of your heart to be. 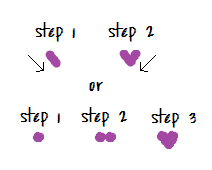 Step 2 - Make a line starting in the right corner of the heart, and go down to meet with the bottom of the heart. Depending on the shape of your brush this might not work properly. I use a brush like brush C in this image so the tip is a bit rounded and can create the rounds of the hearts easily. Step 1 - Make a dot as the top left portion of your heart, you can use a dotting tool, toothpick, bobby pin, anything. Play with different sized items to get different sized dots. Step 2 - Make another dot to the right of the first dot, making sure they line up right. Step 3 - Connect the two dots with a V-shaped section underneath. u r grreat =) thanx very much for the tutorial!! This is SO DARN CUTE. Thanks for the tutorial!! I just found your blog and this is stunning! You are incredibly talented and have amazing ideas for nail art, Wow! I got to try this!! so cute! Awesome! But the image for brush C no longer works so Idk what kind of brush I should use..